Captain James Cook is widely acknowledged as one of the best seaman and probably the greatest explorer, surveyor, and mapmaker during the great age of exploration dating from Columbus’s first voyage in 1492 to George Vancouver’s meticulous survey of the west coast of North America three hundred years later. An experienced sailor and navigator, Cook was commissioned to sail to the South Seas to chart the transit of Venus in 1768. He returned to England in 1771 having circumnavigated the globe and charted the east coast of Australia and the coast of New Zealand for the first time. In 1772–1775 he sailed again with two ships to the South Pacific to disprove the existence of a large southern continent. On that monumental voyage, with his strict attention to the diet of his sailors, he eliminated the incidence of scurvy, heretofore the scourge of long-distance voyagers. Listen to an audio background (mp3) on Captain Cook’s contributions and explorations provided by Antenna Audio. Cook returned once more to the Pacific, his third expedition, sailing from Portsmouth in 1776 in two ships, the Discovery and the Resolution. Among his officers were George Vancouver, who would later lead a four-year survey of the northwest coast of America, and William Bligh, destined to be made famous by the storied mutiny on the Bounty. Also on board were Nathaniel Portlock and George Dixon, who led subsequent fur-trading expeditions to the Pacific Northwest, and a marine officer of American origin, John Ledyard, who later was encouraged by Thomas Jefferson to walk eastward from Moscow to the Pacific, join a Russian fur trading expedition and then seek an overland route east from the Pacific coast to the American heartland (a precursor, perhaps, of the Lewis and Clark expedition). Ledyard actually started out on this eastbound journey but was arrested in Russia and returned empty handed and penniless to Europe. After a year among the islands of the South Pacific, many of which he was the first European to discover, Captain Cook and his two ships reached the Hawaiian Islands and then worked north to explore the northwest coast of America from 43˚ N latitude up to the Arctic Sea above 70˚ N latitude in order to establish the existence—or as it turned out, the nonexistence—of a northwest passage providing a sea route between the Atlantic and Pacific Oceans. Cook spent a month in Nootka Sound, also called King George’s Sound. While there he traded with the natives, repaired the masts and rigging aboard Resolution, and surveyed the extensive inland waterways on the west coast of Vancouver. Then, proceeding up the coast and carefully following his Admiralty instructions, Cook began his painstaking exploration as he neared 60˚ N latitude, closing in to the shore during the daylight hours and standing off at night. He meticulously investigated every major inlet in search of a possible northwest passage, paying particular attention to Prince William’s Sound, Cook’s Inlet, and Norton Sound. 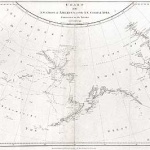 In doing so, Cook and his officers compiled the first truly accurate rendering of the coast of North America well up into the Arctic Circle. He returned to the Hawaiian Islands in the winter of 1778–1779 and was killed in Kealakekua Bay on Valentine’s Day 1779. His officers and men returned to the Arctic Ocean in 1779 and then sailed down the east coast of Asia, touching at the southern tip of the Kamchatka Peninsula and then calling in at Canton (Guangzhou) before sailing eastward to round the Cape of Good Hope and home to England. In Canton, the crew took ashore a load of sea otter pelts they had received in trade in Nootka Sound on the west coast of Vancouver Island and discovered that Chinese traders were happy to pay enormous sums for these rare northern skins; as much as ten thousand dollars each in today’s currency. The crew, seeing fortunes within their grasp, nearly mutinied in an attempt to persuade the ship’s officers to return to North America for more furs. When they arrived in England, their story spread quickly and ignited the northwestern America fur trade, led by Portlock and Dixon, among others, that quickly became the dominant feature of English and American activity on the coasts of British Columbia and southeast Alaska. Once Cook had discovered it, Nootka Sound became well known and often used because of its easy and unencumbered entrance from the Pacific and its sheltered position. Shaped as a broad funnel, it is not difficult to identify when approaching from the sea, and the entrance is easily navigated. Inside, the sound opens up to include many coves and secure anchorages. At the time of Cook’s discovery, there was a large native village just inside the entrance to the North in what is still named Friendly Cove. Subsequently, the English and American fur traders used Nootka Sound both as a trading station and, occasionally, as place to winter over. Today, little remains of the thriving native villages encountered by the first Europeans to land in the sound. There are a few houses and a mission church, now converted to a museum, in Friendly Cove. The anchorage is as secure as ever, however, and the spirits of the first explorers and the natives they encountered are strong and palpable.